So I watched some of the hearing, and I'll try to watch the rest of it later on. There's one thing I have to say right away though. 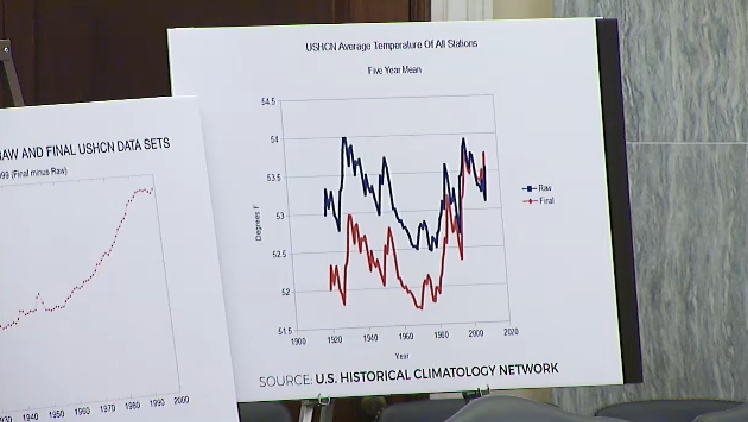 About two hours in (I skipped around) Senator Ted Cruz displayed two charts taken from Steven Goddard, on the basis they show adjustments to the USHCN data set cause massive changes in its results. That's embarrassing. Those charts are complete and utter bunk, and it is shameful they were used in this hearing, much less that they went unchallenged. The methodology Goddard used to create those charts is trivially wrong and known to introduce biases in the results. This has been discussed on this very site, with a humorous example of its flaws being that applying it to a global data set (GHCN) instead of just one for the United States reverses the results, finding that adjustments reduce global warming by a significant amount. @PlancksLaw @Corpus_no_Logos @JunkScience @Foxgoose The plot is completely accurate. Anyone saying otherwise is a fraud..
Zeke Hausfather has written several posts explaining why Goddard's charts are bunk. Steven Mosher has explained the problems with Goddard's methodology as well. Anthony Watts has acknowledged the methodology is wrong. I suspect readers here could think of many other people who have said things like, you have to spatially weight your data or otherwise account for where your data is located so you don't give too much weight to any one area. According to Goddard, they're all frauds. Goddard says you can just average every station together, without concern for where it is located or what its baseline temperature might be (go ahead and simply average those 30C and 10C areas together). That's the only reason he can come up with the charts Cruz used. And according to him, if you think that's wrong, you're a fraud. Another reason I decided to copy it here is it lets me delve into the subject more than I could in a comment on someone else's blog. So that's what I'm going to do. These next two charts are from the United States Historical Climate Network. These are the measurements of the thermometers that are measuring climate change, and these in particular record the adjustments that NOAA [National Oceanic and Atmospheric Administration] has done to the climate data. Anyone hearing that would probably think these charts were official charts, produced by NOAA or some other government agency. Nobody would guess the charts were created by some pseudoanonymous blogger with no credentials or qualifications who routinely rants and raves about massive frauds committed by the government. Now, Cruz offered these charts while talking to Judith Curry, drawing the obvious implication of global warming being exaggerated, or perhaps even fabricated, by humans having adjusted the data. Curry responded somewhat admirably, pointing out the difficulties of creating a global temperature record. However, while she mentioned issues like spatial weighting and time of day biases, it appeared she didn't recognize these charts so she couldn't explain much about them, much less point out what was wrong with them. I cut the quote off there because I got tired of transcribing what soon becomes a train of thought diatribe against god knows what. Basically though, Steyn goes on to say "that shows you how uncertain things are" and then rants on for a couple minutes about how immigration is the real problem, not climate change, or something like that. I honestly stopped paying attention once he stopped talking about climate change. The point here is, Mark Steyn, Ted Cruz and to a lesser extent Judith Curry, all accepted as fact that these charts were valid. They aren't. They're complete and utter bunk. They exist solely because some paranoid nutjob on the internet who constantly rants about how global warming is a hoax decided to create some charts even though he has absolutely no idea what he is doing. Now, normally, I'd be okay with that. I have no problem with inexperienced people trying their hand at things. I actually encourage it. I myself am an amateur when it comes to these things. The difference between Steven Goddard and myself is I am actually interested in the truth. He is only interested in proving he's right. To see the difference, suppose you and I were wanting to create a temperature record for the United States. Now suppose we only had temperatures for the area we live in. I live in Illinois, and let's say you live in... Florida. We both check the temperatures outside. I find it's 50; you find it's 70. We average that together and say the United States's average temperature is 60 degrees. Obviously, that's not right. There are tons of areas we don't have data for. Our results aren't going to be very good. Still, they're the best we can do with what we have. Because of that, we keep repeating this process every day for the next year. But then, next year, you move to New Jersey. Now, when you check the day's temperature, you find it is only 35 degrees. A year has passed, and since it is the same time of year as before, I again find it is 50 degrees outside. We average 50 and 35 together, and the result is 42.5 degrees. Last year we got 60 degrees; this year we get 42.5. Do we conclude the country has cooled by nearly 20 degrees? Of course not. When you create a temperature record, you have to account for where the data comes from. One simple way of doing this is to use what are called "anomalies." Anomalies tell us how much a value has varied from some "normal" amount. If temperatures are usually ~50 degrees where I live, then today when temperatures are 50 degrees, the anomaly is 0. Tomorrow when the temperatures are 48 degrees, the anomaly will be -2. It's easy to see how this would impact our approach. Instead of averaging 50 and 70 together when you lived in Florida, if we were both experiencing the "normal" temperature for our area, we'd both have an anomaly of 0. That'd give us the result of an average anomaly of 0. Now, maybe that 35 degrees for New Jersey was a cold day. Maybe the "normal" temperature there would have been 40. In that case, the anomaly you would have measured is -5. Since 50 is still a "normal" day here in Illinois, my anomaly would be 0. Average those together, and the results is -2.5. That says temperatures are 2.5 degrees colder than they were before, a far smaller amount than the 17.5 degrees we got when we didn't use anomalies. That is just one thing Steven Goddard got wrong. By using absolute values rather than anomalies, Goddard introduced biases into his results. That's not his only mistake though. Another mistake is related to that one. You'll note, in the examples above, there were only two data points at any given time. That's not very many, and all we did was average them together. But what if you and I knew 50 people in Florida? Would we ask all 50 of them what the temperatures were, then just average all their responses in? Of course not. It doesn't matter how much data you add for a single area. You can have one temperature station or a thousand in Florida; either way, you still won't know what temperatures are like in California. It's always good to have more data, but you have to account for where the data comes from. That's commonly done by a thing known as "gridding." What you do is divide your area up into boxes, and you assign each station to a box. You then average all the stations within a given box together to come up with results for that box or area. Once you've done that, you can then average all the boxes together to get your final result. You don't have to do it that way though. There are other ways to handle it. You just have to pick one. Similarly, you have to do something to account for the fact some areas are just, by their very nature, warmer or colder than other areas. When we're trying to look at global warming, our results shouldn't care that Maine is naturally colder than Florida is. The only way that this data tampering could be legitimate is if there has been progressively increasing selective loss of warmer data from the temperature record. That isn’t very credible. Egads! It appears that the world’s land has warmed 2C over the past century! Its worse than we thought! That's right. Steven Goddard claims adjustments used on data for the United States fabricated global warming out of nothing. And yet, if you apply the same methodology he uses to global data rather than just data for the United States, you find a greater amount of global warming. That is, according to Goddard's methodology, these adjustments have reduced the amount of global warming in the global data. According to Goddard's methodology, which has been endorsed by both Mark Steyn and Senator Ted Cruz, government agencies have tampered with the data to fraudulently claim the United States is warming when it isn't while at the same time tampering with the data to fraudulently claim the planet is warming less than it is. This is an example of why members of Congress, and perhaps just reasonable people as a whole, shouldn't rely on random pseudoanonymous bloggers to tell them what is and is not true about the world. I will read this later and watch the podcast. Your link to it over at Judith's didn't work. Perhaps you might like to repost it? Are you sure the link doesn't work for you? There does seem to be an extra apostrophe in it (I have no idea how that happened), but the link worked for me in two different browsers. The apostrophe or something else might be causing problems for specific browsers, but I just want to check if it was was some sort of intermittent thing. Maybe you just couldn't access the site at the moment you happened to try the link? and very good down to earth explanation. that said, this whole affair is so depressing.. Thanks. I couldn't believe it when I saw the screenshot of those charts. I had to actually find it in the video to convince myself it was true. The idea a presidential hopeful would rely on charts created by just some guy on the internet during a Senate committee meeting seemed too crazy to be true. Hi Brandon, clear overview, but I'm left with a problem in understanding how past temperatures could need adjusting - not sure how the average temperature of the location on an EWS can change retrospectively. surely if you were to use the same stations using steven goddards method it would still provide information regarding the trend of the average of those stations ? i can appreciate if stations close, move or change up or down in absolute numbers it will have an anomalous effect ,but using his method on the same stations over a long period of time will provide the average temperature of those stations and the trend in temperature ? "And yet, if you apply the same methodology he uses to global data rather than just data for the United States, you find a greater amount of global warming. " No. What I see is a much longer pause in warming. 1952 - now. geronimo, there are a variety of reasons estimates of past temperatures have changed. Some of them are ones that shouldn't raise any concerns. For instance, back in the 80s when NASA GISS did some of its first work on creating a global temperature record, the internet was not a widely developed thing. Because of that, there were a lot of temperature stations which had recorded data but didn't have their data available online. As time passed and that data was digitized and placed online, more data was made available for people creating temperature reconstructions. When new data is used in calculations, the results can change. Similarly, some changes would happen as methodologies were improved. But the more general concern I hear people express is that temperatures change from to month. To understand why that happens, we can go back to the example I gave in this post. Remember how in the example I found the average temperature for Illinois to be ~50 degrees? What if after doing another year of measurements, I realized the average temperature for Illinois was really ~49? It would be natural for me to go back and update my earlier calculations using this new value which is based on more data. If I did, I'd find the anomaly in the example wasn't 0, it was 1. When I averaged that with the -5 anomaly from New Jersey, I'd find the average temperature for the country is -2, not the -2.5 like I had previously thought. The reason our estimates for past temperatures can wind up changing each month is as we get more data, we learn more about the relationships between all the locations being measured. As we gain more information, we can reevaluate the calculations we did before and try to do them better. What we learn today can help us better understand what happened in the past, so naturally, we might want to redo our estimates for the past. And that goes for adjustments too. If a station moved from one location to another back in 1980, we might not know that. However, we might be able to figure it out by looking at how that station compares to the stations around it before 1980 and after 1980. But we need data to do that. In 2000, the 20 years of data we have after 1980 might not be enough to tell. In 2015, the 35 years worth of data might be enough to tell. There have been many different changes to the temperature records over the last 30 years due to many different reasons. More data has been added, methodologies have been improved and new problems have been discovered. That's how science progresses. The most important thing to realize is nobody should be saying past temperatures have been changed. What's been changed is what people estimate those temperatures to be. And yes, as time progresses and people learn more, they will come up with different estimates. Yup. The only time the methodology Steven Goddard can work is when the network of stations being used remains perfectly constant. As you say, that means stations cannot close or move and new stations cannot be added. It's worse than that though. You also cannot have any missing data as if stations fail to report data for any period of time, these problems will crop up during that period. Additionally, his methodology will still not provide good information if stations are not evenly distributed. If you have more stations in one area than another, Goddard's methodology will favor whatever patterns they may have. That means if one area is warming faster than others and that area has more stations, Goddard's methodology will exaggerate the amount of global warming. So in a perfectly constant and evenly distributed network, Goddard's methodology would work. That's the only time it would though. 1. Is it public and open knowledge what changes and why changes are made when they go from one data set version to the next? 2. Why is it that the net result of these changes seems to always progressively cool the past and warm the present? Is Goddard at least right on the net sign of the changes to the datasets? It just seems there is so much 'made to order science' by Oreskes, Lewandowsky and many others in Climatology. Wasn't the whole 'Moon Landing Hoax' paper by Lew just an attempt at legitimizing the term 'denier' and an attempt to isolate and trivialize anyone who was sceptical? The paper didn't need to stand the test of time. It had the intended effect already. Contempt and derision for sceptical positions has been dialed well past 11. 2) A large part of why adjustments always seem to be that way is just that people like Steven Goddard keep saying they are. You won't hear Goddard talk about any adjustments which have the opposite effect. You generally won't see them discussed at places like Watts Up With That. That said, adjustments do, overall, tend to cool the past and warm the present. Part of that is simply due to the nature of adjustments which are needed. There are certain effects which are known to add a cooling trend to the record. Another part may be people's biases though. It may really be true that adjustments are biased to exaggerate global warming. It's just important to understand those adjustments are nowhere near as large as people like Goddard portray. In the worst case scenario, the issue of adjustments is only going to address maybe 25% of the observed warming. That'd certainly be enough to be relevant and worth discussing, but it wouldn't prove global warming is a hoax. The issue of adjustments is one of detail and nuance. It's one I think we should have. People just need to understand the data isn't adjusted by that much. Global warming isn't going to appear or disappear based on those adjustments. Incidentally, people like Steven Goddard are a significant part of why people like Lewandowsky can get away with the things they do. While Lewandowsky's papers were garbage and his results baseless, a lot of people accepted them because he can point to like Goddard as examples of how skeptics supposedly behave. As long as skeptics keep embracing the whacked out fringe elements of their "side," they'll never get people to see them as anything other than conspiracy theorist lunatics.